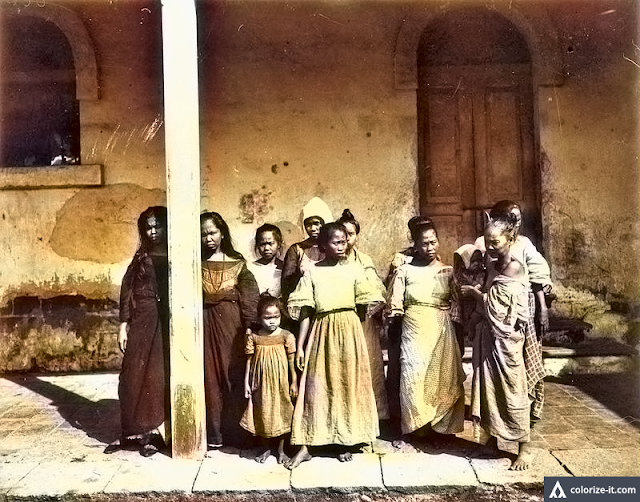 A photo of female prisoners in Batangas 1899. Image source: University of Wisconsin Digital Collections. The picture above was downloaded from the University of Wisconsin Digital Collections. It was submitted to the university by one Alfred W. McCoy and filed by the university archive with the title “Female prisoners, Batangas, 1899.” The location of the prison where the picture was taken is not given, but it does seem curious that there are children in it. Since the date when the picture was taken is placed in the year 1899, then at least we can establish that this was before General J. Franklin Bell’s use of his reconcentration policy forcing civilians in Batangas to live in camps so that they might not have contact with the “insurrectos,” as Filipino revolutionaries were referred to by the Americans in that era. The picture has been processed using graphic software to lighten dark spots and improve sharpness and overall clarity, then colorized courtesy of Algorithmia.